"Summer", by Yevgeni V. Solovyev, estimated at $4,000- $5,000. 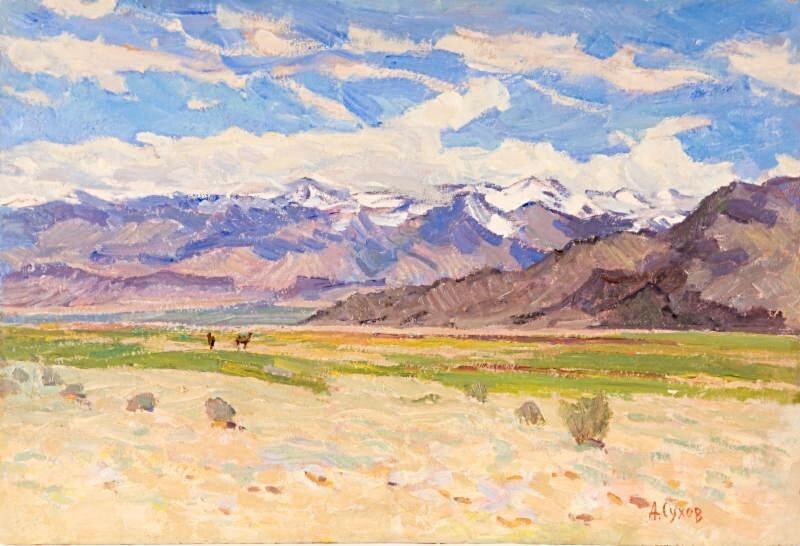 As our September silent auction selection we are pleased to present a beautiful impressionistic landscape, "Windy Day", by Alexander Pavlovich Sukhov, estimated at $3,500- $4,500. This painting is a 'plein air' study, a sketch, painted from life in one sitting. A sketch is the quickest and perhaps the most authentic look at an artist's immediate impression of the countryside. It is not romanticized nor are all the details worked out. Alexander Pavlovich simply and rawly painted what he saw at that moment. It was March 1963 on a cold, windswept morning near the Zarafshan Mountains of Uzbekistan. The painting was a favorite of the artist. It remained in his studio office from the time it was painted in 1963 until his death in 1991. Alexander Pavlovich Sukhov is a recognized a master artist of the Soviet period. Sukhov was an important leader of the arts in Moscow from the time he arrived in Moscow in 1939 for the next fifty years. We invite you to participate in this month's auction and thank everyone who placed bids last month. This is another exceptional opportunity to add a beautiful work by a noted artist to your collection. Estimated at $3,500 - $4,500, the current high bid is just $1,000! The next bid is $1,250, followed by minimum bidding increments of $250. Remember, there is no reserve, at the end of the auction the high bid wins! Bids will be taken via telephone, or e-mail until 7:00 pm MDT, Monday, October 1st. Follow all the bidding updates on the Gallery's website. Sukhov was born in the town of Kasimov (Ryazan Region) in 1921. He lived and worked in Moscow since 1939. He was a member of Moscow Union of Artists and graduated from the Artistic College named after the Memory of the 9th of January in Moscow. Since 1953, he participated in the City, Republican, zonal and All-Union Art Exhibitions. In 1941-1945, he fought in the Great Patriotic War (WWII). The paintings of Aleksander Sukhov are in the collection of many regional museums of Russia, as well as being included in a number of private art collections both in Russia and abroad.